Letitia Wright in ‘Black Panther’ (2018). Courtesy of IMDb. This feature will be on Shuri who is portrayed by Letitia Wright. 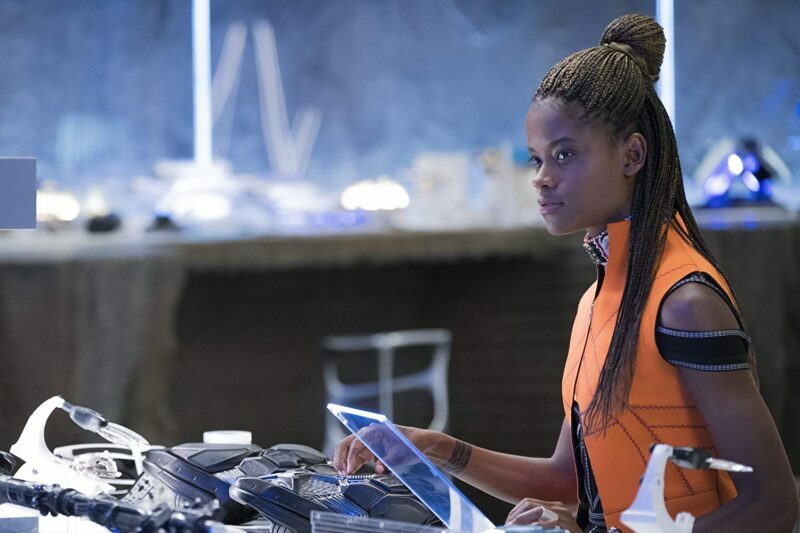 Shuri is the younger sister of T’Challa, and the brilliant mind responsible for all of the amazing technology that Wakanda relies on. It was also confirmed by directors Anthony and Joe Russo that she is the smartest person in the Marvel Universe, surpassing both Tony Stark and Bruce Banner. Ever since we met Shuri in Black Panther, she became our new favorite Disney Princess. Peter Parker isn’t the only young superhero with a love for pop culture references. Shuri was making a reference to a popular Vine in this scene when she sees her brother’s “royal sandals.” It’s just one of many moments and one-liners that make Shuri so lovable. Shuri is many things, but afraid of a fight is not one of them. She has no real super powers, only her superior intellect and technology. Not only that, she is a princess. She is royalty and, as such, she has the protection of fearsome warriors such as the Dora Milaje. But that doesn’t stop her from joining into a fight to not only save her brother, but also her people. At the end of Black Panther, Shuri accompanies T’Challa to California. He takes her up to a desolate looking building, and she tells him some what indignantly “when you said you would take me to California for the first time, I thought you meant Coachella or Disneyland.” Her demeanor changes when he tells her that he has purchased the building as part of a Wakandan outreach initiative, and that he wants her to oversee the Science and Information exchange. Moments later, she is eagerly engaging with a group of young boys from the neighborhood and telling them about Wakanda. After taking a bullet in the back, Agent Everett Ross is brought back to Wakanda for treatment by T’Challa. Upon seeing her brother return with the Agent’s body, Shuri exclaims “Great! Another broken white boy for us to fix!” The “other broken white boy” of course is Bucky Barnes. Shuri was of course not only able to save the life of Agent Ross, but as we find out in an end credits scene of Black Panther, she was also able to reverse over 70 years of brainwashing and programming on Barnes.